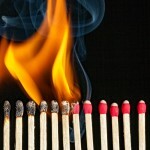 What happens when pesky, disruptive upstarts take on the big incumbents in an industry? 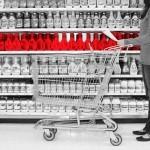 More often than not, they find themselves in a battle royale over market share. And that’s just what’s happening in the wealth management industry, where Westpac is fighting back against the likes of Netwealth, HUB24 and Praemium. This battle provides a very interesting example of competitive forces at work and things to look out for when considering an investment in very fast-growing companies. First a glossary, a Wealth Management Platform (WMP) is basically a software solution whereby financial planners can manage their clients’ investments (or individuals can directly manage their own). It is basically a solution to buy and sell managed funds, individual stocks or other investments in one place. A percentage of the funds that are managed. This fee can be structured in many different ways but generally there is a sliding scale and a fee cap so that you pay a lower percentage the more money you have, and eventually you do not pay more no matter how much you have. Cash account fee. Given that almost all portfolios have some allocation to cash, the total amounts of uninvested cash inside a WMP can be quite substantial. If it is a bank operating the WMP, the bank can use this capital as part of its funding base. If the WMP pays less in interest on the cash balance than the bank is able to lend someone for, the bank can make a very good return on this (this is equivalent to Berkshire Hathaway’s “insurance float”). If the WMP is not inside a bank, the operator of the WMP can offer to lend the cash to a bank to achieve the same result. The spread between what the WMP has to give in interest on the cash balance and what they can earn on the cash balance can be a very significant amount for the operator of the WMP. Transaction fees charged when customers undertake transactions or have special requests. 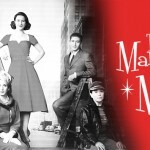 Traditionally, the WMPs have tended to be a bit limited in their investment choices as the big banks and AMP have preferred to see them as tools to channel customers to their investment products and hence make money on both the distribution and management of the investments in a customer’s portfolio. The WMP industry in Australia has long been dominated by AMP and the big banks with each having 15 per cent+ market share followed by a long tail of smaller providers. The WMP has probably been over-earning due to combination of financial planners inside the big banks having to use the in-house platform so they have not been exposed to competitive forces leading to an inefficient price mechanism and lack of investment in innovation have enabled now entrants to compete on both price and quality. The banks’ WMPs are generally quite old and inflexible and very integrated into other in-house systems so changing them and introducing new features is not easily done. 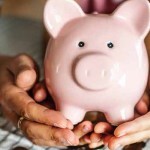 The sector for independent financial advice not affiliated with any of the big banks, has grown quite strongly over the last decade and these advisors are looking for independent WMPs that offer them the best possible choice of investment options. 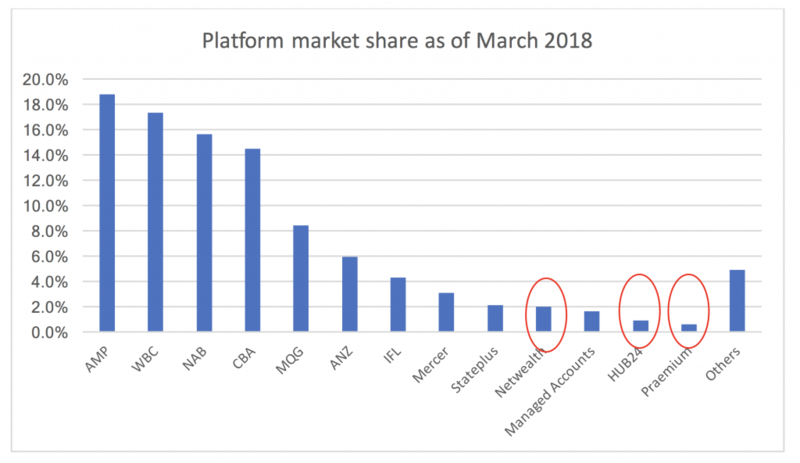 As a result, we can see that in particular Netwealth, HUB24 and Praemium have, despite only having less than 2 per cent market share each, managed to capture 40 per cent of the net flows in the industry (i.e. 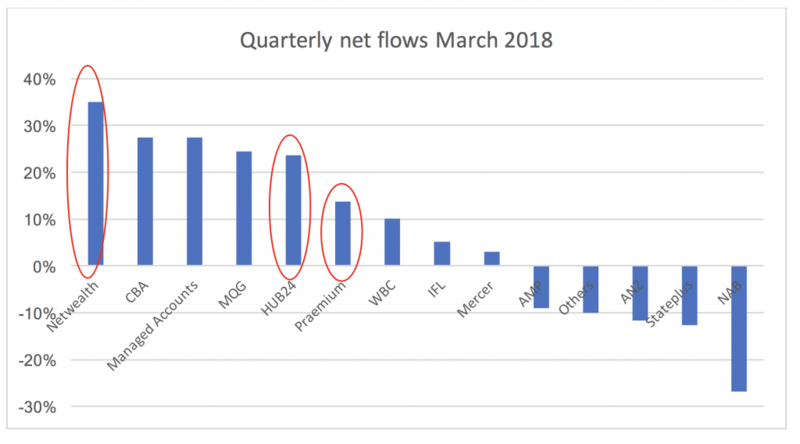 the combination of net inflows/outflows into the industry and the flows between different WMPs) in the total WMP industry on an annual basis and 72 per cent if we just look at the March 2018 quarter, showing on charts below, using data released at the end of June by Strategic Insights, which analyses the sector. 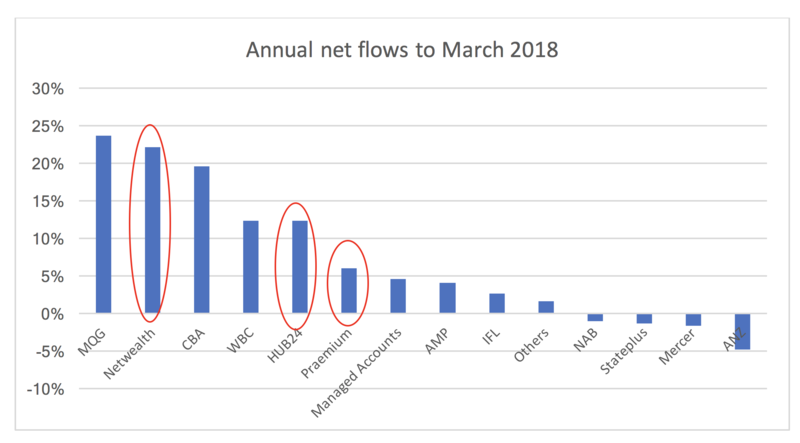 As a result, the share prices of Netwealth, HUB24 and Praemium have been going up very strongly with Netwealth increasing 161 per cent and HUB24 and Praemium both increasing by 57 per cent since 17 November 2017, when Netwealth came to the market through an IPO. The newcomers to the industry have clearly been eating the incumbents’ lunch and benefitted strongly from the inertia and complacency of the old players. Game theory states that when you have such a situation, you would imagine that the incumbents will be fighting back eventually and that is one of the risks of investing in companies that are rapidly changing the game in an existing sector. On Monday this week, we saw just that when Westpac-owned BT announced they are slashing the admin fee charged for new accounts using their Panorama platform to 0.15 per cent of the amount under management up to a cap of $1 million from a previous charge of around 0.35 per cent (uncapped) and that all existing customers can transfer to the new rate if they so request. If all of the existing customers move to the lower rate, it will impact Westpac’s revenues by around $70 million. This means that for an account balance of $1 million, the admin fee for Panorama will be $2040 which can be compared to Netwealth at $3375 and HUB24 at $3420. Westpac has been investing significantly in its platform’s capability – in contrast to any of the other incumbents – and it is by far the most advanced platform of the incumbents so it is interesting to see them taking this step. So, what has been the market’s reaction to this? As at the time of writing (24 July at 15:38), the share prices of Netwealth, HUB24 and Praemium are down 17 per cent, 13.5 per cent and 9.8 per cent respectively since Friday closing price. Although it is clear that the new entrants in the WMP industry will continue to make a big mark, it is worth remembering when looking at companies that are game changers in an existing industry that the path from small to big is not always linear as the incumbents are sure to fight back at some point and this can have quite a negative impact on sentiment, especially as fast growing companies tend to trade at expansive multiples in anticipation that the growth will continue for a long time to come. The Montgomery Funds own shares in Westpac. This article was prepared 25 July 2018 with the information we have today, and our view may change. It does not constitute formal advice or professional investment advice. If you wish to trade Westpac you should seek financial advice. Andreas is the joint Portfolio Manager of The Montgomery Fund. Andreas joined from Navigo Partners, a M&A advisory firm in Stockholm, Sweden where he was a Director responsible for origination and execution of Scandinavian projects. Before this, he worked for three years in corporate strategy at Alinta Energy in Sydney. That is correct, sorry I should have been more clear on that. It is though worth noting that you are in a clear minority not using a financial advisor. I also use Netwealth Super Accelerator to manage my super and it is indeed a very good and user friendly platform. Panorama requires the services of an advisor. which I manage all on my own.